Do people still use the term “kicks” as in the tune—“(Get your kicks on) Route 66”? Anyway—in and out of holiday tunes that are already frolicking through our household are some of those classic songs that help get the party started. And when it comes to the morning of the great meal, with some of the visiting family and friends jumping into the kitchen (requested or not! ), we will always welcome them with a nice flute of sparkling Prosecco! Remember—we’re simply prepping the Thanksgiving or holiday meal in a.m. hours, so there’s no need for Champagne, no need for hefty alcoholic cocktails (Bloody Marys excepted, of course), or even those sweet and fun breakfast ports or craft brew porters. Wait and chill them up for the big meal. What is desired is a festive beverage that will fuel and enlighten the heart and senses keeping everyone happy and enjoying their tasks. ‘Secco is a bubbly that is not sugary sweet but has some light fruit sweetness—barely, and carries flavors of almonds, and is just a touch bitter, which works really well as you’re munching through comforting culinary schemes. Quick as can be, one can dash off to Trader Joe’s or Total Wine & More for very a nice “sweet-pak” i.e., 3 to 4 bottles, of Prosecco for less than $7 a bottle. That’s enough to go around with participants happily focused on their endeavors and no one’s suspect about what Veneto hillside vineyard supplied the grapes. A couple of years ago around this time of year, the sub-heading of this column’s title was “Where’s all the fuss about Beaujolais Nouveau?” Of course, I answered myself with, “Well—there’s not much of it around town. Where have all the Beaujolais Nouveau parties gone?—long time passing.” And nothing’s new. 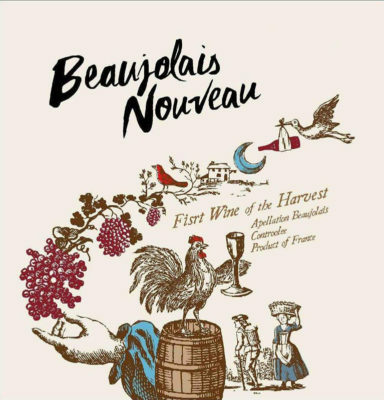 “It’s Beaujolais Nouveau time” is the slogan for ad campaigns and marketing material when on the third Thursday of November , the entire planet frolics French and celebrates the season’s current wine harvest, the bottling—and simultaneously, the uncorking of the youngest wine on earth! I remember such big bashes at French restaurants and grand hotels all over, even around town here in Southern California so far from France. The gathering of wine folk back in the 90s was an event more on pomp and impression than the quality “new” wine from Beaujolais that was being served, although, in very good vintages, actually, Nouveau is a decent young table wine. Whether one finds it lore or not, the six week old wine was traditionally deemed a window into the value and the quality of the current vintage—especially around the Burgundy area, just north of Beaujolais! Good news! The best reporting out of Bourgogne tells us the 2017 vintage is the bomb! So with reverse logic, that news may tell us that this year’s Beaujolais Nouveau is reflective of some very good wine with the more substantial Beaujolais, Beaujolais-Villages, and “Cru” Beaujolais, to be released next year. Why not grab the 2017 Nouveau on its release this week—and now you can be our next wine critic! I’ve personally been a fan of the Three Palms Merlot going back to when Sterling Vineyards was sourcing it in the 80s. Man!—that was always tasty Merlot at a reasonable $15 or so price back then. I continue to recommend this Duckhorn currently, but at its “modern price point” of $90 or so, it’s more of a year-end treat for those so inclined. So for those so inclined, or you wine nerds, or, those just off your sommelier’s exam know already the Three Palms Vineyard is located just south of the town of Calistoga—a warm area; whereas Merlot is typically grown in cooler conditions. Fortunately the rocky volcanic soil there influences the vines to set down deep roots, resulting in grapes bursting with concentrated fruit flavors. 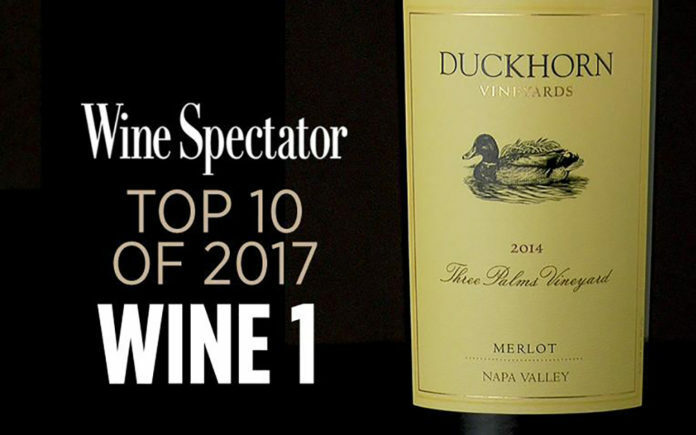 Unfortunately for many vino purchasers, when Wine Spectator publishes their winning results, both the enthusiasts and wine investors are quick to grab up and affect the wine’s availability. Okay early birds—it’s all yours! Cheers!